Bitcoin peaked at $17,803 a day before the Chicago Board Options Exchange (CBOE) launched their Bitcoin futures, paving the way for institutional involvement. This was accompanied by a peak of R249,995 per Bitcoin on the local Luno exchange. On 15th Dec, the CME Group launch their Bitcoin futures product. What is interesting is that the CBOE launch was just a taste of institutional demand, as CME is orders of magnitude larger in terms of audience/users. 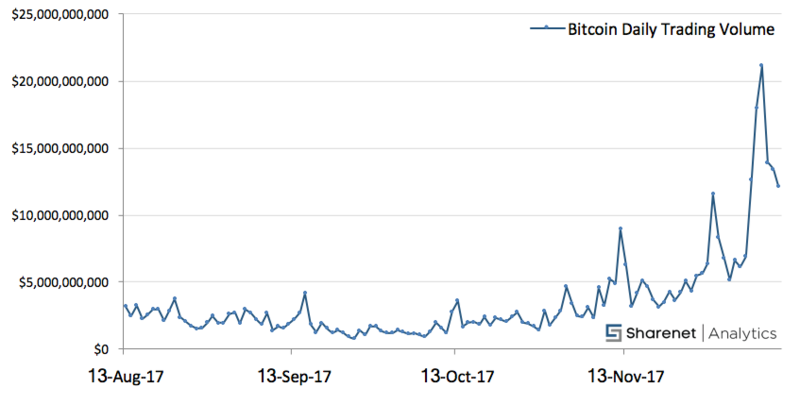 Have a look at how daily trading volume in Bitcoin has been climbing. The CBOE launch was on the last data point on the below chart. At $20bn per day, Bitcoin daily trading is 3-4 times larger than that of Apple or Amazon. Which brings us to the next interesting milestone. The total market capitalization of Bitcoin now sits over $290Bn as shown below when compared to the world’s largest companies by market-cap using current prices. The last column is interesting - it shows what price Bitcoin must attain to match the market cap of the respective company. To reach the top-10 position requires a price of $21,000. To be bigger than Tencent or Berkshire Hathaway, Bitcoin needs to reach $30,000 (assuming of course that Tencent and Berkshire share prices have not also risen). When measuring Bitcoin, we prefer to look at the whole Bitcoin Family that hard-forked from the original blockchain. In other words, if you held Bitcoin in a wallet where you controlled the private keys, you would have inherited the Bitcoin Cash and Bitcoin Gold forks (for free), so long term holders of Bitcoin would see price appreciation much greater than Bitcoin itself. If, like we recommend to our Crypto Club members, you keep holding Bitcoin and all the forks you inherit for free then not only do you get some diversification, but you get better gains. Contrary to popular belief, when a fork occurs on the main Bitcoin network it actually boosts the price over the medium term even though there is a small price drop of the main chain in the short term. If you consider that the whole Bitcoin fork family market cap peaked at $325Bn that would put it just a whisker under 10th place. Dwaine van Vuuren is a full-time trader, global investor and stock-market researcher. His passion for numbers and keen research & analytic ability has helped grow RecessionALERT.com (US based) and PowerStocks Research (now Sharenet Analytics) into companies used by hundreds of hedge funds, brokerage firms, financial advisers and private investors around the world. An enthusiastic educator, he will have you trading and investing with confidence & discipline.